Anyone can record a video of their screen and upload it to YouTube. But creating a compelling, high-quality screencast that people will actually watch and share… well, that’s a bit more challenging. As you pay closer attention to the details, it’s easy to become overwhelmed with new questions. What screen recording software should I use? Which microphone is best? How do I soundproof my recording area inexpensively? 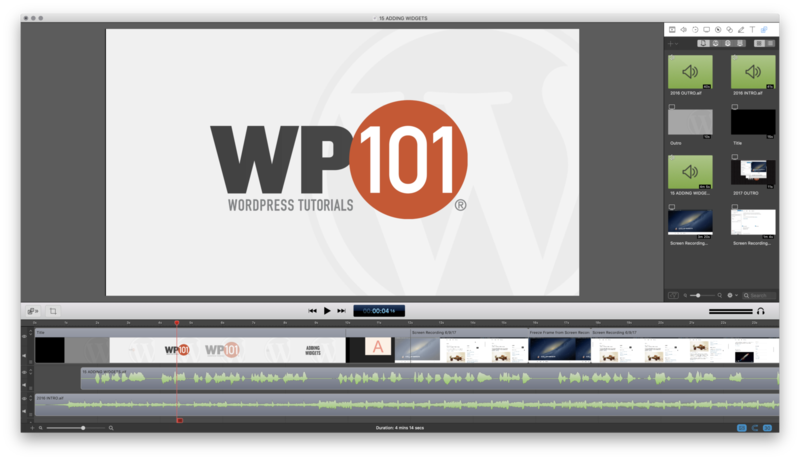 Over the past eight years, I’ve created hundreds of screencast videos for my own WordPress tutorial site, as well as many other clients. Along the way, I’ve continually streamlined and improved my process and workflow. Every day, I learn new ways to improve my craft and create even more effective learning videos. In this post, I want to share just a few of the tools and techniques I’ve picked up along the way, so that you can create even better-quality screencasts and learning videos. Ready to dive in? At a minimum, you’ll need software to record your on-screen actions and accompanying narration, then export and share that video with others. If you use a Mac, you’ll find that you can create decent screen recordings using the free QuickTime Player application. Just launch the app, then choose File > New Screen Recording and click the red button to begin recording your screen actions. You can record either your full screen, or just a portion of your screen. When you’re finished recording, simply save your video to your computer, or share it via email, YouTube, Vimeo, or any of the other built-in destinations. While this method is fine for creating very simple screencasts, you’ll soon discover that the editing tools are quite rudimentary, if not downright frustrating. So, when you’re ready to begin creating more professional screencasts, you’ll want to invest in a proper screen recording program like Camtasia or my personal favorite, ScreenFlow 8. ScreenFlow 8 screen recording software in action. Camtasia and ScreenFlow cost roughly the same, offer similar features, and function in pretty much the same way. But each application has a slightly different user interface and editing tools. You may find that you simply prefer one over the other. Personally, I prefer the overall experience of ScreenFlow, including the editing interface and the powerful export tools. The 1-click “Publish to…” feature in ScreenFlow 8. My favorite feature in ScreenFlow is the ability to publish directly to YouTube or Vimeo with just a single click. This eliminates the time-consuming process of exporting, then converting the final video into a suitable format, and guessing at a suitable data rate, final size, or frame rate. Best of all, the final video is of noticeably higher quality when exported directly to the video hosting service. Q: What screen recording software do you use and recommend? A: Hands-down, ScreenFlow. On a PC? Camtasia is your only choice. Believe it or not, the first thing people will notice about your screencast video is not the video itself. It’s actually the quality of your audio. If you record your narration using the built-in microphone in your laptop or desktop computer, the audio will likely be muffled or unclear, filled with distracting background noises, echo from the surrounding room, or worse… the clatter and thud of your fingers on the keyboard. So, after the screen recording software itself, the next most important piece of equipment is a high-quality microphone. Most podcast and screencast producers these days opt for a USB microphone, which are both affordable and provide decent quality audio. One of the biggest advantages of using a USB microphone is that they require no additional hardware. Simply plug the USB cable directly into your computer, and you’re ready to start recording! In my test, the Yeti by Blue Microphones was, and continues to be, one of the best-sounding USB mics on the market, second only to the AT2020USB+ by Audio Technica. Still, most podcasters I know prefer the highly-popular RØDE Podcaster. This is largely a matter of personal preference, and it’s a good idea to test several mics to see which one sounds the best with your voice. But when you’re ready to step up your game, you’ll want to move beyond USB microphones and purchase a professional-quality dynamic studio microphone. Why? Simply put, because USB isn’t capable of powering a large-diaphragm microphone. Why does the size of a microphone’s diaphragm matter? The diaphragm in a microphone is a thin piece of material that vibrates when it is struck by sound waves. These vibrations are converted into an electrical current which becomes the audio signal. A small diaphragm, like those used in USB microphones, is easily overpowered, resulting in distortion and ‘plosives’ — those annoying ‘pops’ when you pronounce the letter ‘p’, for example. Unlike USB microphones, professional studio microphones have large diaphragms, which means they can capture and reproduce your voice more accurately, without the distortion of a USB mic. But, larger diaphragm mics also require amplification, typically from a pre-amp. But, professional microphones require a standard XLR microphone cable, instead of a USB cable. That means you can’t plug the microphone directly into your computer. Instead, you’ll plug the microphone into a pre-amp, which in turn, is plugged into an audio converter, which is plugged into your computer via a USB cable. Apogee Duet audio interface in action, showing breakout cable with mic cable and two speaker outputs. Most audio interfaces include a built-in pre-amp, which eliminates the need for a separate pre-amp. 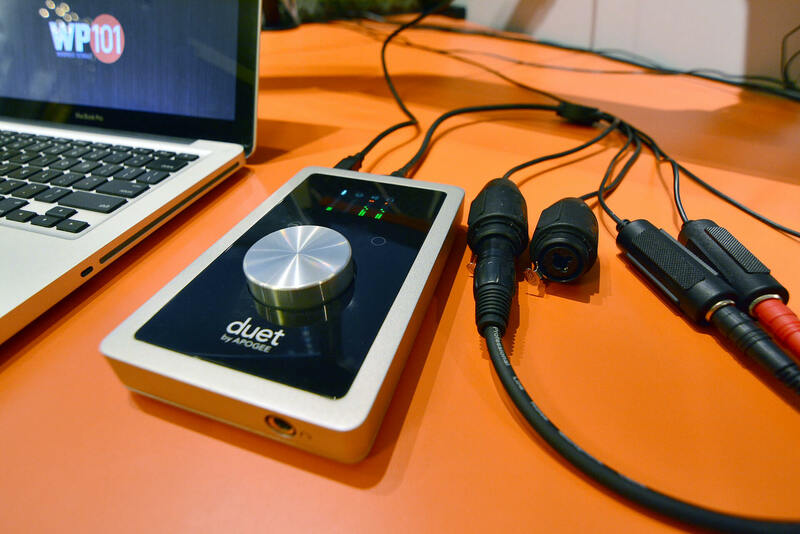 For example, the Apogee Duet is an award-winning audio interface that does two things at once: 1) it amplifies your microphone, AND 2) it converts the audio into a digital signal for your computer and recording software. As a bonus, you’ll notice a dramatic improvement in the overall quality of audio played back from your computer when it’s routed through the Duet instead of the built-in headphone jack. The difference when listening to music is night and day, and even if you’re not an audiophile, you’ll enjoy the improvement! As for the microphone itself, I recommend you start with the excellent RØDE Procaster microphone (shown on right), which has earned a reputation for being one of the best vocal mics on the market. The RØDE Procaster is a professional, broadcast-quality dynamic microphone, specifically designed for voice applications in a broadcast environment. 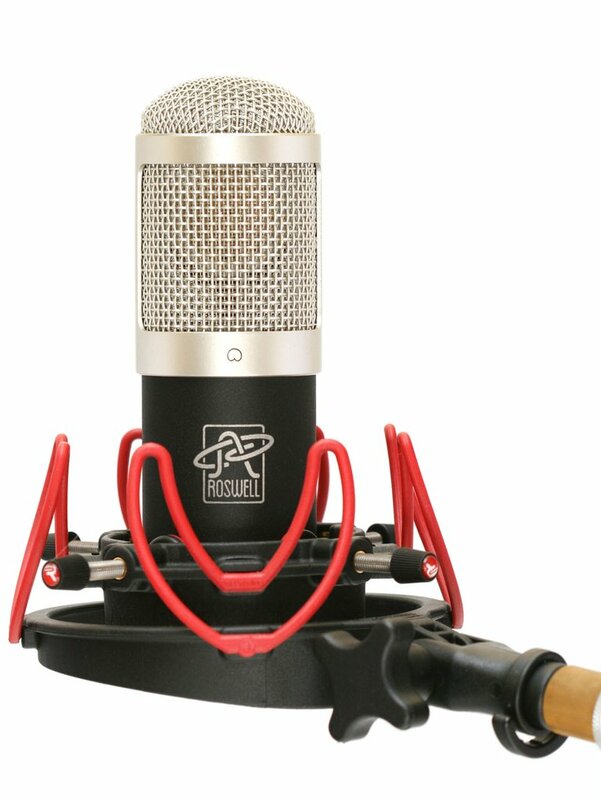 The Procaster features an internal pop filter, designed to minimize those plosives sounds that can overload the microphone capsule and distort the audio output. If you’re ready to get even more serious about your audio, you’ll want to consider the stellar Roswell RA-VO microphone. It’s a purpose-built studio-quality voiceover microphone, developed specifically for delivering the absolute best vocal reproduction. 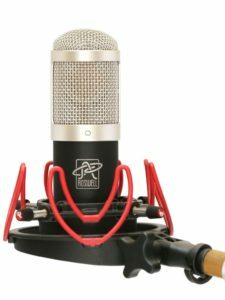 Roswell is a boutique microphone company that has earned high praise from musicians, home studio owners, and Grammy award-winning producers and engineers. They worked with Jordan Reynolds, a professional voiceover talent and audio producer, to develop the RA-VO microphone. They tested multiple capsule types, circuits, and tunings, over multiple iterations, until they found a microphone that made Jordan put his former go-to voiceover mic back in its box for good. The RA-VO delivers perfectly accurate voice reproduction that sounds like you’re sitting right next to the listener. There’s nothing harsh or shrill about this mic. It is easily the most flat and natural-sounding mic I’ve ever heard on my voice. For my audio interface, I chose the Universal Audio Arrow, the first Thunderbolt 3-powered desktop recording audio interface for Mac and Windows. It’s different from other audio interfaces, in that it not only offers noise-free audio conversion and TWO Unison mic preamps, but also includes a suite of onboard plug-ins you can use for studio-quality results. You can record using reproductions of the classic 610 Tube Preamp, LA-2A and 1176 compressors, and the legendary Pultech EQs — with zero latency. In short, it’s like getting a whole studio of high-end gear that would otherwise cost thousands of dollars. 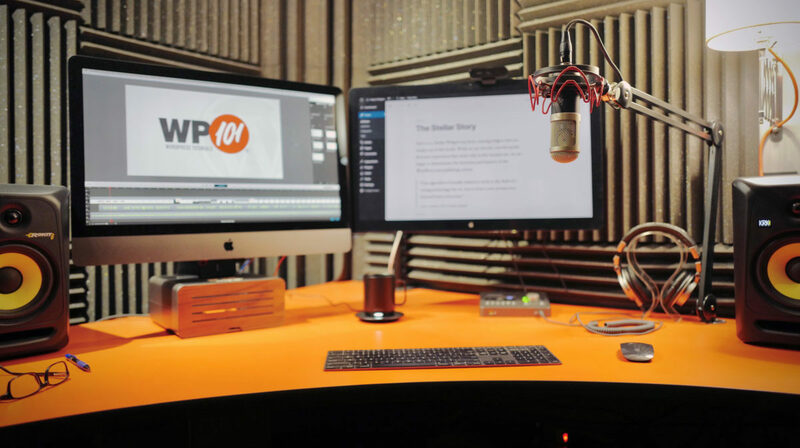 Your voiceovers will sound like they’re recorded in a professional studio! Q: What microphone do you recommend? 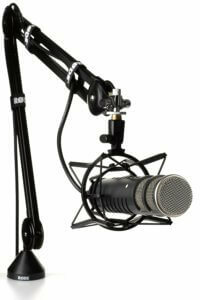 Good: If you’re just getting started, try the Yeti by Blue Microphones or the popular RØDE Podcaster USB microphones. Just plugin into your computer and you’re set! Better: When you’re ready to step up your game, you’ll want a pro mic like the RØDE Procaster, powered by an audio interface like the Apogee Duet or the Focusrite Scarlett 2i2. 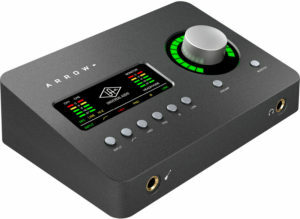 Best: If you’re serious about your audio, consider the Roswell RA-VO microphone and the Universal Audio Arrow interface. 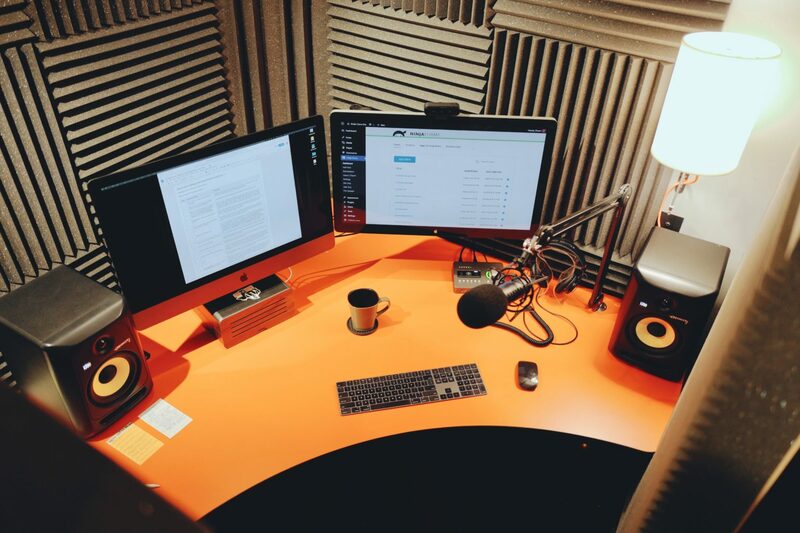 Unless you have access to a professional recording studio, you’re likely recording in your office or perhaps a semi-quiet room in your house. But, as you’ve probably already noticed, your microphone still picks up distracting background noises and echo from the room itself. Hey, nobody wants to hear your phone ringing or your dog barking in the background of your video. Professional voiceover artists use expensive, purpose-built vocal booths, which are insulated and completely soundproof. But you don’t have to spend a fortune to create a reasonably soundproof environment for recording your own voiceovers. A well-known hack among beginning voiceover artists is to simply record in a clothes closet. The hanging clothes in the tiny space dampen and absorb the sound of your voice, rather than reflecting it back into the microphone, virtually eliminating echo and creating that intimate, “up close” sound. But, if you’re like me, you prefer to record at your desk. If so, buy two of these inexpensive DeskMAX panels by Auralex, and position one on either side of your computer and microphone. These do an amazing job of eliminating room echo, and may be the only additional soundproofing you require! 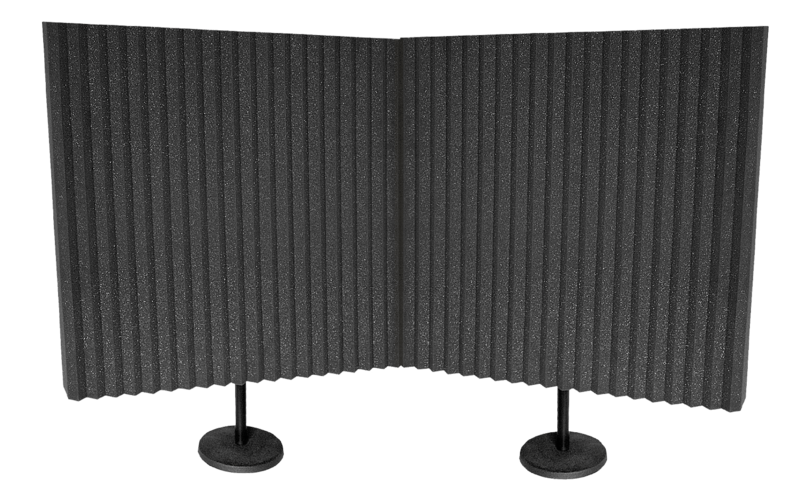 Auralex DeskMAX panels are an inexpensive way to cut down on that annoying room echo. Outside the booth, with mobile panels in place, creating a temporary vocal booth. Inside the booth, where the magic happens! With these panels in place, I have an almost completely soundproof vocal booth. Best of all, these panels are temporary and can be easily stored away when not in use. Again, you don’t need to go this far. Just grab two of the DeskMAX panels and see what a difference they make. Q: What’s the easiest way to cut down on room echo and background noise while recording? A: Purchase two DeskMAX panels, and position one on either side of your computer and or microphone. 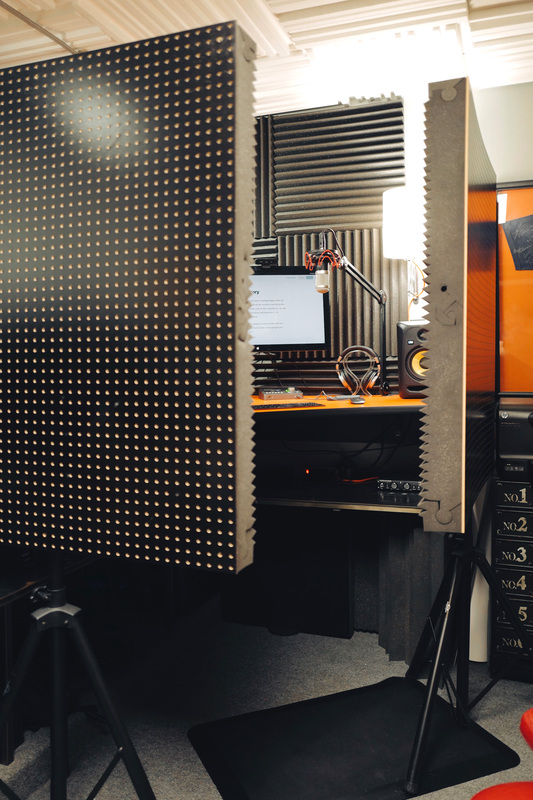 To go one step further, purchase two MAX-Wall panels and position them directly behind you as well for an excellent temporary vocal recording booth. There are two methods for recording screencasts. Most amateur screencasters simply hit “Record” in their screencasting software and then record their screen actions while narrating at the same time. This often results in awkward pauses — “uhs” and “ums” — because it’s quite difficult to concentrate equally on both the on-screen actions and also your narration. I prefer to create a detailed, word-for-word script first, during a ‘dry-run.’ Then, I record the voiceover or narration in GarageBand, carefully inserting deliberate pauses where needed. Next, I import that audio file into ScreenFlow, and then record my on-screen actions while simultaneously playing back the narration audio. This ensures that the narration is as clear and succinct as possible, and that the on-screen actions are perfectly synced to the onscreen instruction being presented. Set up a local demonstration environment. Write a detailed, word-for-word script during a dry-run. Notate where longer pauses might be needed. Record the narration/voiceover in an audio recording program. I use GarageBand, with a handful of plugins. But don’t simply read your script! Rather, strive for a conversational tone, as if you’re talking with your best friend. Export the final audio file, then import it into ScreenFlow. Record the on-screen actions while simultaneously playing back the audio. Add animated intro/outro graphics to beginning/end of the video. Add appropriate background music, reducing the volume of the music (called, “ducking”) so it doesn’t drown out the spoken word. Export the final screencast directly to the video host (Vimeo, YouTube, etc). If your application supports Full-Screen mode, enter that mode before recording. This will completely hide all those folders and files cluttering your desktop, as well as your menubar. I use Google Chrome for nearly all my screencasts, so I also hide the address bar, tabs, toolbars, and bookmarks bar — basically everything other than the main browser window, ensuring the entire recording area is available for my content. No distractions. 3. Change your screen resolution. Newer laptops and monitors support very high screen resolutions up to 5120×2880 or even higher. The problem is, your audience will likely not view your video at that same, gorgeous, full-screen resolution. Many people may watch your video on a mobile device. And when your video is viewed at smaller sizes, text and other items in your video may become too tiny to be legible. One easy way to handle this is to simply change your screen resolution to 1280×720 before recording your screen actions. This is still HD video resolution, but will ensure legibility when your video is viewed on smaller screens (like mobile devices). PRO TIP: If you are not using a Retina or QHD monitor, set your resolution to 2560×1440, but then zoom the web browser to 200% to mimic a 1280×720 monitor. This will ensure that everything on screen is still legible, even on a mobile device. And, it has the added benefit of allowing you to zoom in ScreenFlow without pixelation or sacrificing image quality. 4. Increase the size of your cursor. Even if you record at 1280×720, your mouse cursor can still appear very tiny, which makes it difficult for your viewers to follow your onscreen motions. If you use a Mac, go to: System Preferences > Accessibility > Display and increase the Cursor Size to “Large” before recording. This will make it easier for your viewers to follow your onscreen actions as you move your mouse around the screen. 5. Install the SmoothScroll extension for Chrome. It’s disorienting to watch a video that suddenly jumps up or down the screen. It makes it nearly impossible to follow your onscreen actions. As the presenter, you know that you scrolled down the page, but your viewers are left to wonder what just happened. The SmoothScroll extension for Chrome slows down your scrolling actions, easing your screen up and down smoothly when you scroll with the mouse wheel or the keyboard. This enables your viewers to more easily follow your onscreen actions, plus it adds a degree of professional polish to your final video. You don’t need to invest in expensive software to create simple animations (or, ‘bumpers’) for the intro and outro of your videos. Both ScreenFlow and Camtasia include handy editing tools you can use to create simple animation effects like fades and zooms. Sometimes, that’s all you need… and simple is always best. But, you can create more interesting animations including transitions and effects in Apple’s Keynote (or PowerPoint, though it doesn’t contain the same cinematic-quality transitions and effects). Then, you can simply export the animation/presentation as a video file, and import that file into your screencast project. Or, for even better results, play the presentation in full-screen mode, while recording the screen in your screencast program. As I mentioned before, one of the most useful features in ScreenFlow is the ability to publish directly to YouTube or Vimeo with one click. This eliminates the time-consuming process of exporting, then converting the final video into a suitable format, while guessing at a suitable data rate, final size, or frame rate. Best of all, the final video is of noticeably higher quality when exported directly to the video hosting service. But for years, I exported a ‘Lossless’ video file at full-resolution, then used HandBrake to convert that video file into a more web-friendly format and size. Once you’ve created your screencast video, the best way to publish and distribute your video is to simply upload it to a video hosting service like YouTube, Wistia, or my personal favorite, Vimeo. Then, you can easily embed your video into a post or page on your own website and invite folks to watch your video there. You won’t have to fuss with slow web servers or bandwidth issues. No need to create multiple file formats for every type of mobile device. Just upload once, and then share your latest professional-quality screencast! Stop hosting your videos on your own server! Use Vimeo instead. Use promo code: SPRING10WP101 to save 10% on an annual subscription to Vimeo Plus, PRO, Business, or Premium. Hurry, this offer ends 5/31/19! Did you find this helpful? If so, why not share it with someone? I’m one of your customers…and just have to say how much I like this post…so helpful. What you said is great, but even *more* great is the demo of those microphones. Comparing them “side by side” like this really makes it possible for me to make a real judgment. Thank you. Glad to hear you found it helpful, Christian! Why do you like Vimeo Pro over Wistia? I used Wistia and totally loved it. Wistia’s great, which is why I listed it. But it’s also quite a bit more expensive than Vimeo PRO, and to be honest, I prefer Vimeo’s player UI over Wistia’s. Still, if you need deep analytics like viewer engagement and history tracking, Wistia’s a solid choice. Gotcha. I like Wistia’s UI, but if you don’t there’s def. no reason to be paying quite a premium when there are options. How did you position the mics in the 6 way shootout? I have an Apogee Mic, but am not getting anywhere near the quality of your recording. All the pics were positioned in the same way: suspended from a RØDE PSA1 boom arm and placed about a hand-width from my mouth. I used the aforementioned DeskMAX acoustic panels by Auralex on either side of the mic(s) while recording. Hope this helps! I’ve been trying to add decent quality screencasts to my plugin support site and just haven’t been able to come up with something decent. So THIS is the post I have been needing!! Thanks! Happy you found it helpful, Chad. Thanks for dropping by! so you record complete audio first before video? That’s right. During the dry run-through, I script any pauses that might be necessary. And, if needed, you can always edit the audio when it’s matched to the screen actions to add more silence here and there. Awesome write-up Shawn… really helpful as I prepare my first screencast / talk recording for the upcoming Genesis Camp! Glad you found it helpful and timely, Dave. Thanks for dropping by, and best of luck with your upcoming screencast/talk! I wanted to add another helpful tip , maybe adding a seperate user on your computer might eliminate all of the junk for instance if you had to browser your computer for files you don’t want people to see your folder hierachy, or like you said the 1001 icons that you might have on your computer. I have a few users, one for me, one for my son and one for training. Hi, I was convinced to use ScreenFlow but it is for Mac only? Is that possible? Thanks. That’s right, Jackie. But Camtasia—the other software we recommended above— offers versions for both PC and Mac. Can I do this with Screenflow? Or would a competitor like Camtasia be better suited? I’ve used neither yet. Both ScreenFlow and Camtasia will capture video from an attached iOS device. And both apps make it easy to import other footage… like the live footage of your hand holding the device, for example. BUT, neither of these apps include the ability to split the screen with your screen capture on one half and the live footage on the other. For that, you may need to step up to a more full-featured video editor like Final Cut Pro or something similar. If the purpose of the live footage is merely to show gestures, you may find that the “touch callouts” accomplish the same purpose. These are basically on-screen indicators that mimic finger gestures, so that your viewers can see what your fingers are doing. These touch callouts can indicate touches, double-taps, swiping, and more. I really appreciate that you have put down your whole process step by step. Is there a more detailed blog post on that? Great post Shawn! Thanks for taking the time to share these tips. I’m following your advice and my project is turning out great thanks to your advice. Great article – there aren’t many out there on this topic that aren’t “beginner tutorials”. Learned lots. Great article. It’s one of the few out there and so I hope it moves up on Google’s organic searches!!! Quick question. Maybe not an easy, but basically, it’s this. I’ve got a decent audio interface (Focusrite) and it’s recording my speech in left channel, which is fine. However, when I steer Camtasia to record from my audio interface, the sound quality is not only terrible, but bounces from mono (left) to stereo (both). How do others take full advantage of the audio interface? The solutions I’ve found so far are absurdly disappointing. Based on what I’ve found, others, INCLUDING Camtasia’s OWN trainers, record the screen and audio separately. They record the audio in audacity, do their editing, and import it over. I and many other don’t have time for that clunky workflow. At this point, I don’t see another option other than to get a decent USB mic and give up on the audio interface. Please share with me your thoughts on this. Many thanks in adv. Thanks for the feedback, dk. Man, I wish I could help with the issue you’re describing, but I have no experience with the Focusrite audio interface and Camtasia. I assume you’ve already done so, but I would recommend contacting their support team to see if this is a known issue. I’ve never encountered similar issues with my hardware setup. FWIW, I also record my audio separately, then import it into ScreenFlow before recording my screen actions. It’s a much more professional workflow that will yield a higher quality finished product. In addition to the reasons I outlined above, recording your audio separately enables you to properly mix and master the audio, which you can’t do within Camtasia (or ScreenFlow). Like Shawn, I record separately. I find that by writing a script, recording screen (NOT audio) while reading from the script, and then doing the voiceover, I can get my best results, fastest. I then record the voiceover, edit gaffes and gaps in Audition (or Audacity) and drop the audio into Screenflow. By quickly splitting the video (pressing the t key) Screenflow lets me quickly adjust the speed of the clip to match the voiceover. Thanks for the quick reply, Shawn. It’s not just Focusrite, I’d borrowed another audio interface and had similar results. In brief, Camtasia Recorder has really poor audio recording capabilities. So for busy people who want to pull together a quick and dirty, but quality, screencast, we are stuck w/ USB mics. BTW, I totally agree that recording, mixing, and editing audio outside of Camtasia provides the most polished and professional audio. No disagreement there. I’ve done it and lived it. For those who think audio not important, they are wrong. A smooth and rich sounding audio track are significantly more well received; people enjoy a professional production. Before I leave, I just want to leave it open to anyone who’s successfully used audio interface directly into Camtasia, please let me know how. Many thanks, and I look forward to more of your posts. Hi Shawn, just wanted to say thanks! I have just started out with my own screencasts. I had been testing lots of styles and workflow management techniques, but your article really did the trick. Which plug ins do you use with Garage band? I use PSP Vintage Warmer 2 to add some warmth, FabFilter’s excellent Pro-L limiter, and then the built-in DeEsser, Noise Gate, and Channel EQ plugins. I loved this post. The idea of scripting out and recording the audio separately has saved me an _incredible_ amount of time. Your system for screencasts works really well for me. The one challenge I’m running into is how to easily sync my audio with my video. I haven’t found a way to start recording my video while simultaneously playing back my audio. Because of that, I always start one after the other which involves me having to manually sync the audio/video. Any suggestions or how do you workaround that? Thanks for dropping by, Alex. I’m thrilled to hear you found this post helpful. When I record in ScreenFlow, I use the countdown feature before recording the screen actions. As it’s counting down from 5, I’m getting ready to start recording, ensuring that the main ScreenFlow window is still active and the audio is cued for playback. As soon as the countdown hits zero, I hit the spacebar, which begins playing the audio from ScreenFlow. Then, I quickly switch (Command-Tab) to the web browser in which I am recording. Now I’m able to record my onscreen actions in sync with the voiceover. When I finish recording the screen actions, I drag the new screen recording into the ScreenFlow project, placing it roughly in line with the audio track. Now, I usually find that it’s helpful for the onscreen actions to occur just slightly ahead of the voiceover. So I’ll nudge it to the left just a tad. For me, it’s usually just one or two left-arrows. Finally, play back the project, and adjust again if necessary. ahh, yes. it does help to know that’s the technique you use. i’ll try that on this next screencast. after i posted this comment, i did come up with another strategy that ended up working out really well. 1. leave five seconds on the screenflow timeline on the pre-recorded audio track (audio A). 2. tell screenflow to record audio _and_video. once it starts recording, hit play on audio A. 3. record the screen actions as you follow along with audio A. 4. drag the new audio/video track onto the screenflow timeline. because you told screenflow to record both audio and video, it captured audio A a second time (audio B) along with the video. 5. line up the start of audio A with the start of audio B. 6. play both audio A and B tracks at the same time. use the [ and ] keys to nudge the audio B track until it’s synced with audio A (i.e. when there’s no echo). 7. once you get that position, you can delete the audio B track. hopefully both our techniques will help future readers. I am just getting into this, but if it’s not too much trouble, would you be able to make a quick video tutorial showing what you mean? I’d love to understand your steps in a visual/audio way. TIA! What suggestions do you have on background music? Thanks for dropping by, Valera. Excellent question. I think the addition of background music can help to differentiate your video, give it a more professional polish, and add credibility — all while setting the tone for your content. The key is finding just the right piece of music… one that doesn’t overpower the voiceover, but sets just the right tone for the subject matter. I’ll often spend an hour or two listening to dozens of samples before deciding on the right piece of background music. It doesn’t help that so much royalty free music is “cheesy” or overly-corporate sounding. I like the selection of royalty-free music at PremiumBeat.com, but there are dozens of similar sites. When you add a piece of music to your video project, it’s a good idea to utilize “ducking” — lowering the volume of the music when the primary narration starts, and then lifting the volume again whenever the narration pauses or is finished. You can hear this effect in my own videos, like this one. Hope this helps, but if you have further questions, feel free to follow up any time! Shawn, have you had a chance to try the relatively new Capto for Mac? I stumbled upon it when looking to update my version of their Voila screen capture software. It’s pretty inexpensive at $30 but I wonder how it compares feature and interface-wise to ScreenFlow. Great article, Shawn! I had one pretty specific question: I have a condenser mic that’s mono going through an M-Audio Fast Track sound card into my Mac. The problem is, when I’ve tried to record on several screencasting apps (ScreenFlow, Screenflick, even Quicktime), all I get is mono sound in the left channel. How do I make it stereo? Is that even a possibility, or do I have to buy a stereo mic? What app did you take that screenshot from? Hey, Russ. The screenshot was taken from the Audio tab in ScreenFlow. There’s an Audio Mix section where you can find the pan controls. Thanks so much for this fantastic tutorial screencasts. I need to start creating screencasts for my business, but I was “stuck”. This took my step-by-step through exactly what I need for my set-up. And now I’m excited to start recording my own screencasts. Thanks sooooo much! Great article Shawn thanks. I tweeted you last week but wanted some clarification on the process of recording audio BEFORE recording on screen behaviour. I.e. how do you listen whilst recording? Use a 2nd app? Also, do you use anything to indicate what’s coming next so you’re not just reacting to what you hear? Do you have a 2nd monitor with the script or at maybe bullet points? Actually, the featured image at the top of this article is my recording setup. I record my narration in GarageBand, edit it, then import it into ScreenFlow. Then, I play back the audio from ScreenFlow, which usually lives on my primary monitor on the left, while simultaneously recording my screen actions on the right-hand monitor. ScreenFlow allows you to play back the audio while also recording the onscreen actions. I do often have the script pulled up as well, for reference during the recording. But since I shoot for videos that are only 5 minutes in length, it’s usually easy enough for me to remember what screen actions to perform during the recording. So you can record the screen with ScreenFlow whilst listening to audio on ScreenFlow? I use Camtasia which does not allow this – maybe that’s the key difference. Shawn, your article here is the single thing that has helped me wrap my head around all the nitty gritty of making screencasts the most. Everything ‘clicked’ after reading it. One question: you say to set your monitor resolution to 1280×720. That does result in the best output, by far. But… if I zoom in at any point (using Screenflow) the screen (especially text) looks blurred. I guess this is because Screenflow is trying to add pixels that weren’t actually recorded. 2. It doesn’t look as crisp as recording at 720p natively. 3. It’s not as easy to read text in the browser. However, zoomed text doesn’t look as blurry. I can’t seem to find a good trade-off. Do you have any ideas on this? Re. my last comment: I think I’ve figured this out. I simply can’t zoom in and still have crisp text if I record at 1280×720. So I definitely need to record at a higher resolution to be able to do that. I also need to make sure I choose an ‘exact’ 16:9 resolution (integers). 1920×1080 for example. So I’ve tested recording full screen at 1920×1080, but also zooming the browser to 125%, to make ‘default size’ text a bit more readable. And then when I zoom in to an area of the screen, using a Screenflow video action, I zoom to 100%, so text is super crisp (cos it’s at the resolution it was recorded at). And scaling down to 720p still leaves everything looking pretty good at the ‘default’ size. This also works better for me too because the app I mainly demo in my screencasts needs a bit more screen real-estate than 1280×720 affords. It’s a good trade-off, for me anyway! Only posting this here in case anyone else finds it useful. You’re absolutely right. If you record at a monitor resolution of 1280×720, you cannot zoom in ScreenFlow without the text becoming blurry or pixelated. Actually, since I wrote this article, I’ve changed how I record my monitor. First, I have two 27-inch monitors. I run ScreenFlow on one, and record my browser on the other. Both monitors are set to 2560×1140. When I record, I still use Chrome in fullscreen mode. Then I zoom the browser to 200%. This mimics the same experience as viewing on a 1280×720 monitor, but essentially doubles the resolution. Now, my secondary monitor is just an Apple Thunderbolt Display, whereas my primary monitor is a 27″ Retina iMac. If I were to record on my iMac, I would have four times the resolution, due to the high-res Retina display. Then I’d have to zoom my browser to 800%, but that would also create very large video files… unnecessarily so. So, you’ve arrived at the best strategy. Record in higher resolution, then scale down in ScreenFlow. This gives you plenty of resolution to zoom in ScreenFlow as you like, without getting blurry text. Hi, I loved the article! May I ask why did you not mention many of the current video maker software, including iMovie, which comes pre-installed on the Mac and is very easy to use? Thanks for your feedback and your question. While I love and use iMovie for editing short family movies, it does not support screen recording. You can’t record your screen in iMovie, which is what screencasting is all about. Now, I suppose you could use QuickTime Player to record your screen (File > New Screen Recording), then export the resulting screen recording, and finally import that file into iMovie. But that would result in a lot of extra work and unnecessary steps. And, you still won’t benefit from the features that purpose-built screencasting software includes for this purpose, including the ability to override your cursor, create callouts, pans and zooms, and export directly to video hosting services like Vimeo. In short, I’d recommend using the best tool for the job. iMovie is great for editing movies, and you might even start out using it for screencasting. But in short order, you’ll likely want to upgrade to a “proper” screencasting tool like ScreenFlow or Camtasia. Someone asked how would you join audio and video together, I heard of a program called Plural Eyes 4 from redgiant.com. Not sure if you can use it with ScreenFlow 7, but final cut pro is an option. I got the idea after watching DIY Video Guy on Youtube. Thanks for this walk-through. It is really helpful as I’m just starting out. Can I ask about capturing hand drawn annotation such as for a maths tutorial. Would you recommend attaching a graphics pad or drawing directly on a normal touch screen laptop. I will be using a surface to run the camtasia software and so could just use that directly. But I’m not sure if that is the best way. Would you recommend any other software for the drawing part or can I draw directly in the camtasia interface? Great question, Dan. I have no personal experience with capturing hand-drawn annotation in real-time, but I found this conversation thread that appears to confirm you can do exactly what you’re trying to do: Anyone try using a drawing tablet with Camtasia Studio? Maybe try Videoscribe? Much quicker and easier than drawing it yourself!! I believed you used to recommend the Shure SM7B mic. Did you fall out of favor with it? Thanks! Yes, I used the excellent Shure SM7B for years. This past year, I switched to the RØDE Procaster instead. In my side-by-side comparison, the Procaster sounded just a bit better on my voice. The Shure SM7B sounded very ‘mid-rangy’… flat and muddy, by comparison. Both mics are very power-hungry, each one requiring about 60db of gain from your pre-amp. But since they’re both dynamic mics, they also both excel equally at rejecting room noise. You can’t go wrong with either one, in my experience. Though it’s worth mentioning that the RØDE Procaster is more than a hundred bucks cheaper. Hope this helps! Thank you so much for all this very useful information!